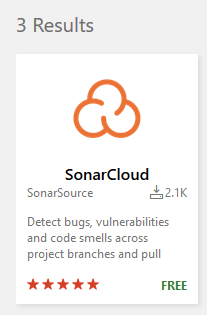 I’ve blogged some weeks ago on how to analyze OS code with SonarCloud, but it is time to update the post, because if you want to use SonarCloud you have a dedicated extension in the marketplace. 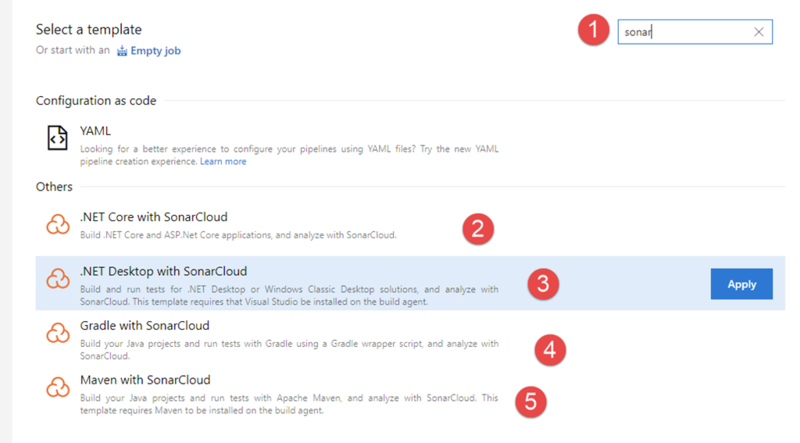 Figure 1: Official SonarCloud extension in the marketplace. Having a template make super easy to create a build, you just choose .NET Desktop with SonarCloud and you are ready to go. As you can see in Figure 2 you can also use Azure DevOps pipeline to build with Gradle, maven or .NET core, so you are not confined to microsoft tooling. In Figure 3 there is the build created by .NET desktop project template (remember that this template can be used also for web application, and for every .NET application). Figure 3: .NET Sonar Cloud analysis template. The only task you need to configure for Sonar Cloud analysis is the Prepare analysis on Sonar Cloud. 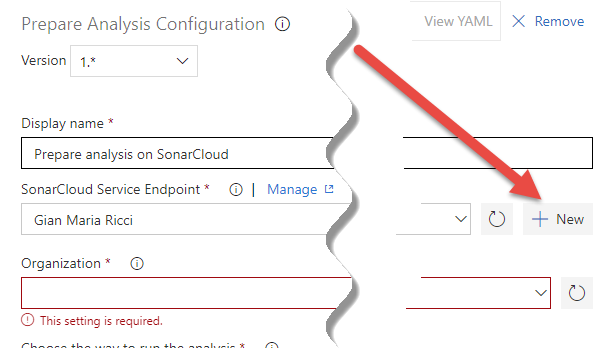 As you can see in Figure 4, you should first create an endpoint that connect Azure DevOps to your SonarCloud account. 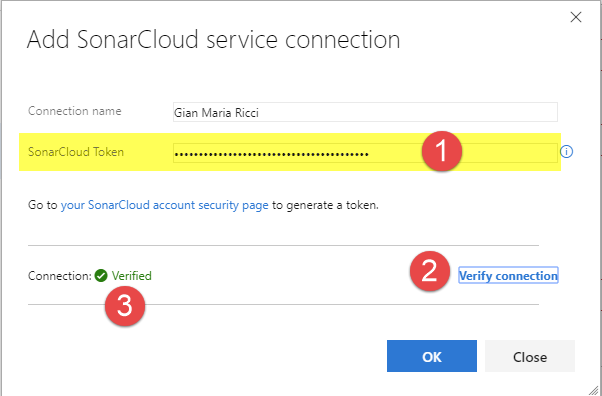 Configuring the connection is really simple, just give a name to the connection and specify the access token (you should first generate a token in SonarCloud). Then, as shown in Figure 5, press Verify Connection to check that everything is ok. 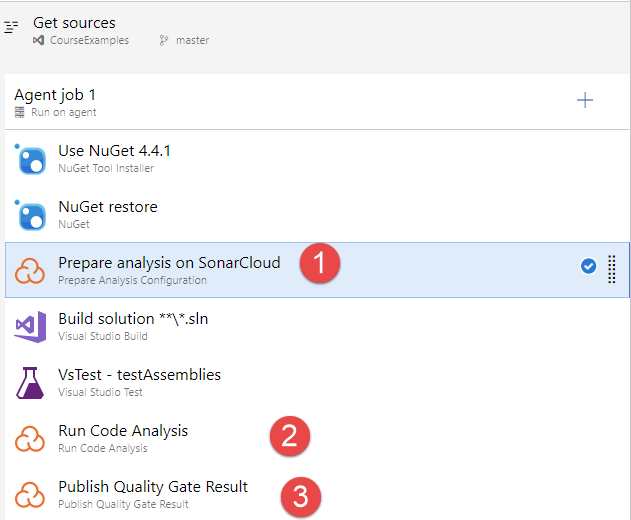 Figure 5: Configuration and test of the connection between Azure DevOps and SonarCloud. Thanks to the concept of external services, you can configure one or more connection to SonarCloud and having it available in the build without disclosing tokens. Once you’ve selected the connection, just specify name and key of the project, and other optional parameters if you need to do a custom analysis. In less than a couple of minutes you have a build up and running. Just configure the agent to use Hosted VS2017 pipeline and queue a first build to verify that everything is ok.
Once you have configured the build with the visual web designer, you can convert to Yaml build with few steps. Clearly I prefer to have a YAML build for a lot of reasons, once the build is up and running simply press the YAML button in the build definition to have your build converted to YAML. # Build and run tests for .NET Desktop or Windows classic desktop solutions. Finally, if you still have not installed Azure Devops Pipeline in your GitHub account, I strongly suggest you to do so, just follow the instruction of this article, it is free and gives you free hosted pipelines to run your build for free. Yesterday Microsoft announced a change in naming for VSTS, now branded as Azure DevOps. You can read most of the details in this blog post and if you are using VSTS right now you will not have a big impact in the future. Event is this is just a rebranding of the service, there are a couple of suggestion I’d like to give you to have a smoother transition. Visual Studio Team Services was rebranded in Azure DevOps, this will not impact your existing VSTS projects, but it is wise to start planning for a smooth transition. 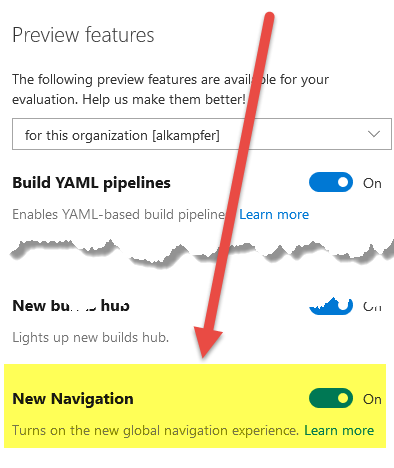 First of all, if you still don’t use the new navigation, I strongly suggests to enable it, because it will become the default navigation in the future, and it is best to gain familiarity with it, before it will become the only UI available. The nice aspect is that you can enable new navigation only for your account, then enable for all accounts in the instance. This will make the transition smoother, you can find key member of your teams that wants to try new features, let them explore it and after some time let everyone use the new interface, knowing that at least some core members of the team are well used to it. Planning for a smooth transition instead of having big bang day when everyone can only use the new UI it is a wise approach. Another suggestion is starting to use the new links right now, if your account is https://nablasoft.visualstudio.com, your new URI will be https://dev.azure.com/nablasoft and it is already available for all of your accounts. You can expect that the old URI will work for a really long time, but it is better starting to use the new URI as soon as possible, to avoid having link in the old format that maybe will cease to work some years from now. Another part of the service that is affected by change of uri is remote address of git repositories. Microsoft assures that the old url will remain valid for a long time, but it is good to spend 1 minute updating remotes to never worrying that some day in the future remotes uri can break. Figure 2: Change the url of origin to adapt to the new uri of Azure DevOps Repositories. Updating git remote address is a good practice to immediately start using the new and official link. Thanks to git, the only thing you need to do is grab the new link using the new UI, and use the command git remote set-url origin newlink to update uri of the remote to the new one, and you can continue work as ever (the first time you will be prompted by a login because you never authenticated git to dev.azure.com domain). Some days are passed, but it is good to remind you that TFS 2018 is finally out. 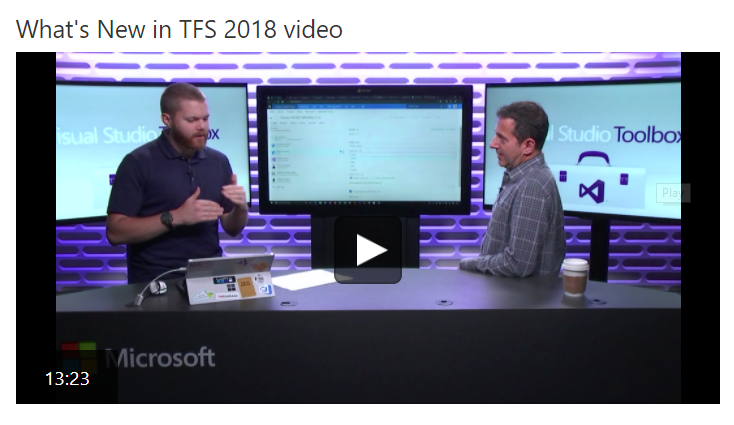 Some people are surprised because after TFS 2015 we had TFS 2017 and we are still in 2017 and we already have version 2018, but this is the good part of the ALM tools in Microsoft, they are really shipping tons of new goodness each year :). Release note page contains all the details about the new version, from that link you have a small 13 minute video that explain what is new in this version and as usual in the page you have a detailed list of all the news with detailed information about each of the new features. I strongly suggest you to start verifying system requirements and planning for the upgrade, because, as usual, it is a good habit to install the latest bit if possible, to avoid having to do a big bang upgrade after years of not upgrading. Apart new features, the above link informs you on all the features that are actually removed from this version, because they were deprecated in the old version. This can be an update blocker, but I strongly suggest you to start thinking to a remediation pattern, instead of being stuck forever in the 2017 version. From removed features, Team Room is probably the least impacting, very few people are using it, and you can use Slack or other tools. Tfs Extension for SharePoint were also removed, this is also a feature that very few people will miss. The Lab Center in Microsoft Test Manager was also removed, but probably the most important missing feature is the XAML Build support. In TFS 2018 you can only use the new build introduced with TFS 2015, no excuses guys, you really need to migrate every XAML build to the new format, as soon as possible. It is really simple to create a build agent for VSTS that runs in Linux and is capable of building and packaging your DotNetCore project, I’ve explained everything in a previous post, but I want to remind you that, with docker, the whole process is really simple. Anyone knows that setting up a build machine often takes time. VSTS makes it super simple to install the Agent , just download a zip, call a script to configure the agent and the game is done. But this is only one side of the story. Once the agent is up, if you fire a build, it will fail if you did not install all the tools to compile your project (.NET Framework) and often you need to install the whole Visual Studio environment because you have specific dependencies. I have also code that needs MongoDB and Sql Server to run tests against those two databases, this will usually require more manual work to setup everything. In this situation Docker is your lifesaver, because it allowed me to setup a build agent in linux in less than one minute. Here are the steps: first of all unit tests use an Environment Variable to grab the connection string to Mongodb, MsSql and every external service they need. This is a key part, because each build agent can setup those environment variable to point to the right server. You can think that 99% of the time the connection are something like mongodb://localhost:27017/, because the build agent usually have mongodb installed locally to speedup the tests, but you cannot be sure so it is better to leave to each agent the ability to change those variables. Thanks to the –e option I can specify any environment variable I want, this allows me to specify TEST_MSSQL and TEST_MONGODB variables for the third docker container, the VSTS Agent. The ip of mongodb and MSSql are on a special interface called docker0, that is a virtual network interfaces shared by docker containers. 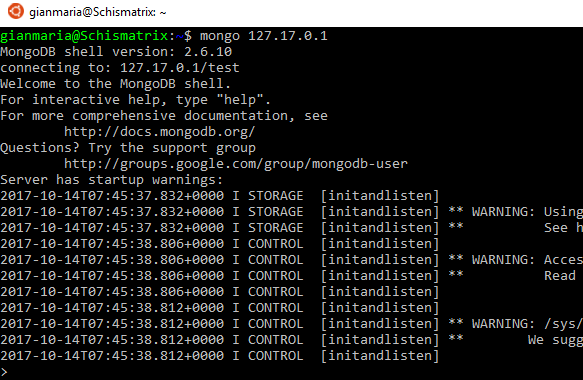 Since I’ve configured the container to bridge mongo and SQL port on the same port of the host, I can access MongoDB and MSSQL directly using the docker0 interface ip address of the host. You can use docker inspect to know the exact ip of the docker container on this subnet but you can just use the ip of the host. With just three lines of code my agent is up and running and is capable of executing build that require external databases engine to verify the code. This is the perfect technique to spinup a new build server in minutes (except the time needed for my network to download Docker images :) ) with few lines of code and on a machine that has no UI (clearly you want to do a minimum linux installation to have only the thing you need). In VSTS / TFS Build system, you can change the status of the build, between three states: Enabled, Paused and Disabled. The Paused state is really special, because all the build trigger are still active and builds are queued, but all these queued build does not starts. Figure 2: Really high number of build queued, because the build definition is paused. 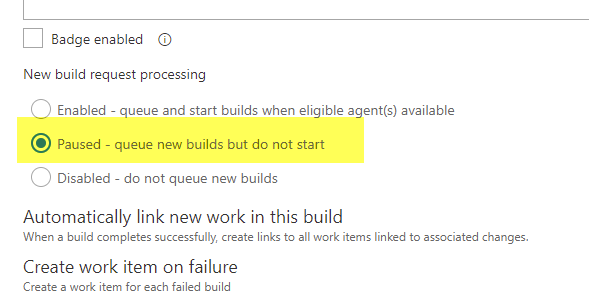 What happened in Figure 2 is that some user probably set the build to paused, believing that no build will be queued, after some week he want to re-enabled, but we have 172 build in queue. Now if you are in a situation like this, you probably need to remove all queued builds before re-enable the build definition. If you set the build to active you have the risk to completely saturate your build queue. To solve this problem, just go to the queued tab of the build page. From this page you can filter and show only queued build for the definition that was paused, you can then select all queued builds, and then delete all scheduling at once. Thanks to the filtering abilities present in the queued tab, you can quickly identify queued build and do massive operation on them. Now that we deleted all the 172 queued build, we re-enabled the build without the risk of saturating build queue.